Guys, this is so easy and fun! I just adore bath bombs. I buy them from a super sweet shop, but I've also made them on my own a couple times now. If you haven't experienced the goodness that is bath bombs, you're missing out. 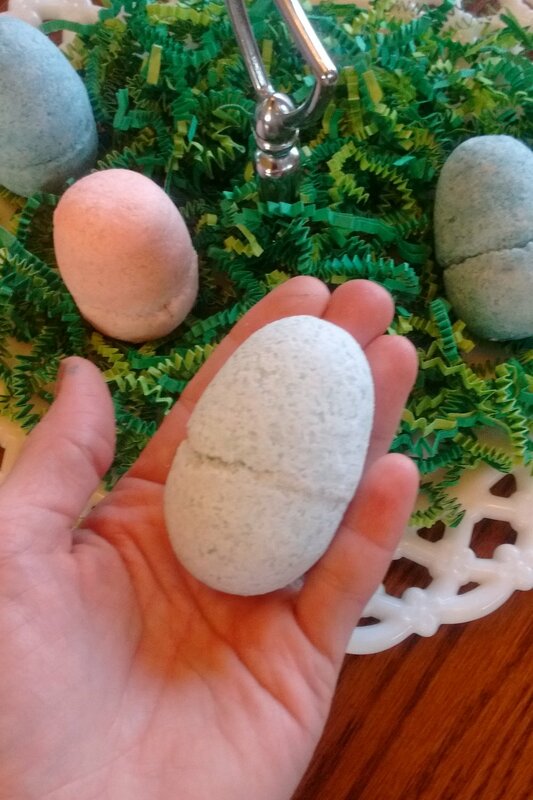 They're anywhere from ping-pong-ball-sized to pool-ball-sized, and you toss them in your bath-- they fizz up, smell amazing, and make your skin soft. Just add a glass of wine and you're at the ultimate of relaxation. I've mentioned before that I'm the creative activities leader for my moms' group. Making bath bombs is something I've wanted to do for ages. Well, I've finally set us up to make them next week . . . but I won't even be there! Ah, well, such is life. I had to make a practice round or two on my own anyway to make sure everything goes smoothly for them. This is a great activity for a girls' night, slumber party, or a large group craft like at my moms' group. 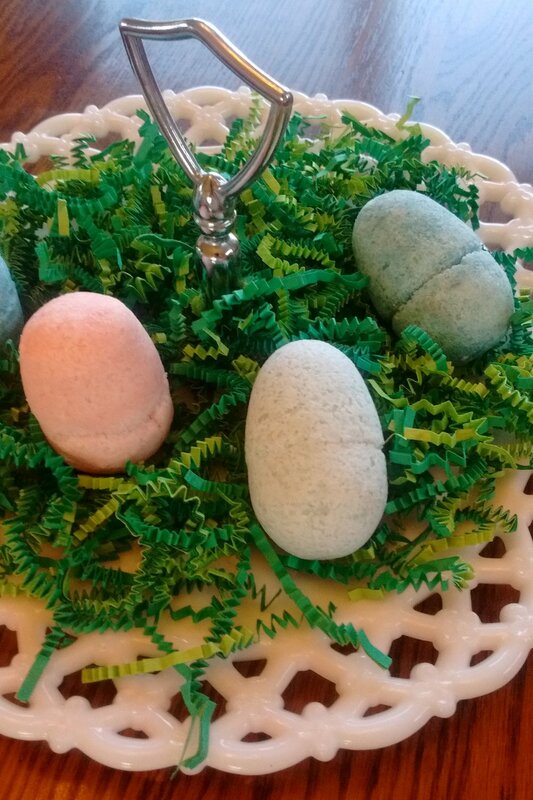 Today, I'm showing you how we used the plastic Easter Eggs to form the bath bombs. However, there are actual bath bomb molds that you can buy on Amazon (here's a great set on Amazon that I ordered, or these look good too, if you wanted different sizes), or another good option is to line a muffin tin with cupcake liners and press the mixture into them. 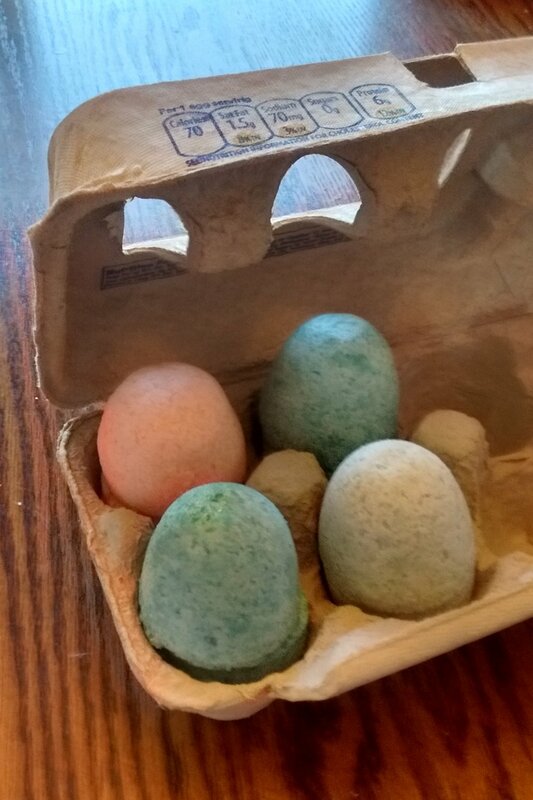 Bath bombs take some time to dry, so using the Easter eggs as molds is perfect for my moms' group-- they're an affordable option to allow the moms to take them home in the eggs, and let the bomb dry out at home (no car or purse messes along the way!). I'm going to have each small table make their own batch and mold them at their own tables. Please see the bottom of the post for notes on supplies. Step One: In a large bowl, mix your dry ingredients together. Step Two: In a small bowl, mix your wet ingredients together. I love using lavender essential oils for mine. Rosemary is another relaxing scent, and citrus oils work well too. I do like to add food coloring, but you don't have to. Just 4-ish drops is perfect in my opinion. And it's diluted enough, you won't have to worry about it staining your tub or turning your bath water the bright blue. Step Three: SLOWLY add the wet ingredients to the dry ingredients. Do this little by little. Using a spoon to drip it in works nicely. If you go too fast, your mixture will fizz and bubble, which is what you don't want. I found that it works best to have one person whisk the dry ingredients while a second person slowly drops the wet ingredients in. When you're finished adding it, the mixture will be very crumbly . . . almost sandy. When you pick it up and press it, it should retain some shape--then you know it's the right consistency. Step Four: Pack your molds. Press the mixture into the eggs like brown sugar. Press very firmly. Make sure it's absolutely full when you're closing it because you want the two halves to connect and dry together. Work quickly so the remaining mixture doesn't dry out. *Citric Acid is pricey here in the stores, so I order this pack on Amazon. 5 pounds is a lot! I wanted to make sure that I'm able to make at least 75 bath bombs. If you have smaller bath bomb goals than I do, here's a 2 pound bag. ** Epsom Salts! So there are scented epsom salts, and plain epsom salts. Go plain, or your essential oils will be rendered useless. The plain ones are by the pharmacy stuff, the scented ones are typically by the bubble bath. *** Essential oils. I'm not here to tell you what kind is "best" or argue for or against them. But, statement of fact: they smell nice. If you want to use the pricey name brand kind, go for it. If you want to use some from Walmart, go for it. I'm not gonna judge. It's just for the scent. It's not like you're eating it ;) If you want to skip the essential oils, you could try the scented Epsom salts. I haven't tried it, but it could work to replace the EOs with more coconut oil and use the scented Epson salts as your scent. It could be worth a try if you weren't in to the EO thing.